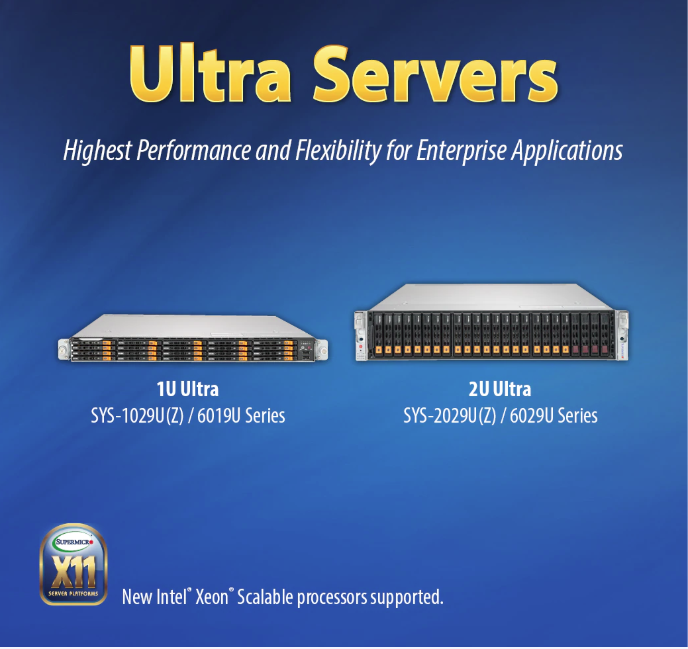 Supermicro Ultra SuperServers are designed to deliver the highest performance, flexibility, scalability and serviceability to demanding IT environments, and to power mission-critical Enterprise workloads. With support for the latest Intel® Xeon® Scalable processors which boast incredible benefits over previous generations. Brand new advancements in Intel Xeon architecture include Intel UltraPath Interconnect (UPI) and Cross Bar technologies which provide direct communication between two CPUs in a dual socket server to catapult performance and dramatically reduce latency. Available in 1U and 2U form factors, Ultra SuperServers support up to: 3TB DDR4 2666MHz in 24 DIMMs; SATA3 with optional SAS3 and NVMe support for increased storage bandwidth; a variety of Ultra Riser options, including built-in 1G, 10GBASE-T, 10G SFP+, and 25G Ethernet options; support for add-on SAS 3 HW/SW RAID controllers and additional PCI-E 3.0 slots. The range is the perfect fit for diverse workloads and applications and can be easily reconfigured for multiple Enterprise and Data Center applications in Virtualization, Big Data, Analytics and Cloud Computing.